The A.S. Council approved the budget for the upcoming 2016-17 school year on Wednesday evening at an open meeting held at Price Center Forum. The money appropriated in the budget comes from the accumulation of student fees, which amounts to almost $5.2 million this year. Financial Controller Justin Pennish explained how a number of events converged to make this year’s budget one of the largest the A.S. Council has had in recent years. The meeting lasted about three hours, in which the entire council went through the document line by line, making revisions to specific line items and sharing its respective offices’ goals for the school year. The newly created Office of Health and Wellness was a point of interest for many A.S. Council members due to the initially low allocation in program funding. Associate Vice President Jonathan Slowey drafted the language to create the office two years ago while working in the Office of the President to institutionalize a way for students to be involved with health and wellness campaigns. He cited the age of the office and its unique position as reasons for focusing on funding collaboration rather than programming, as well as his previous experience with the limitations of A.S. funding. Another office is experiencing a new impetus for expansion and support. Associate Vice President Omid Tabatabai of the Office of Spirit and Athletics explained his vision for athletics as a part of UCSD’s identity. The Office of Equity, Diversity and Inclusion has seen a dramatic increase in staff in order to expand connections to various resource centers around campus and to give students the opportunity to attend the National Conference on Race & Ethnicity in American Higher Education. The Office’s Associate Vice President Minh-Hieu Vu reflected on the importance of growth in the context of the recent political dialogue surrounding diversity. Other notable line items from the budget included permanent item initiative and the art initiative from the Office of Student Organizations. Associate Vice President Angie Aguilar elaborated on how these allocated funds will be used to create opportunities for art-based events that have not been possible due to restrictions of A.S. funding policies for items that cannot be used up at a single event (such as art supplies). 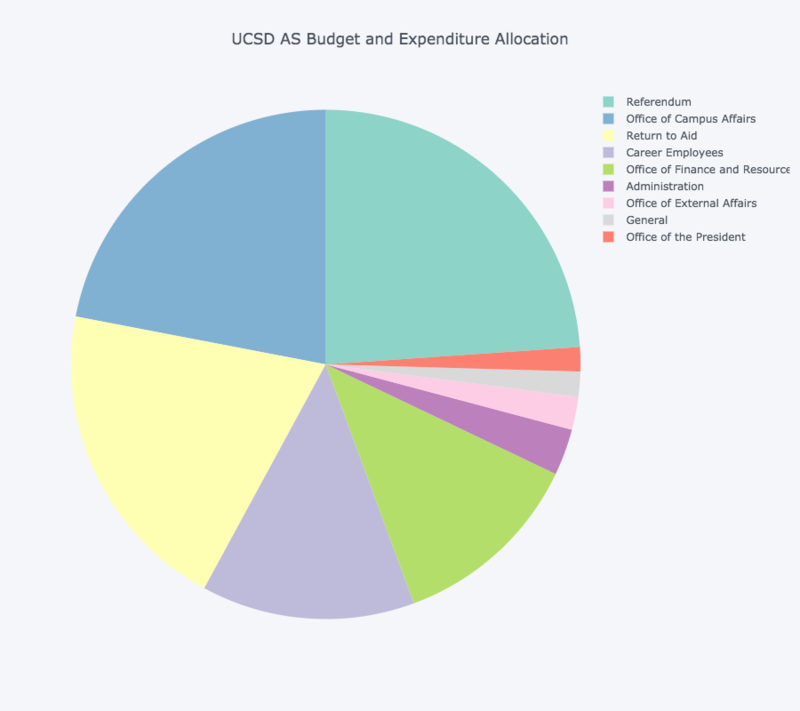 Changes in this budget include the increase in A.S. senator stipends from $10 a week to $20, the collaboration of A.S. Side Rides with Uber for subsidized rides, the increase in funding for the Office of Spirit and Athletics in light of the Division I referendum and the expansion of Triton Television and Triton Outfitters equipment. Pennish said this was the first time in several years that the A.S. budget has been at a surplus, which has opened up new opportunities to expand what AS can do to to improve our campus. “Because of [the increased pool of money], I was able to fully accommodate the budget request of each Associate Vice President office, as well as allocate funding to priorities such as the new A.S. Fellowship program, greater student organization funding [and] Triton Food Pantry expansion costs, among others,” Pennish told the Guardian.